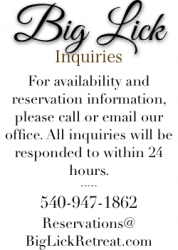 There’s plenty to do at Big Lick Retreat, but if you want to get out and explore the Virginia Western Highlands or West Virginia’s Greenbrier Valley, there’s something for everyone– shopping, dining, spa services, gallery hopping, golfing, or even skiing– take your pick! Covington offers unique opportunities for sightseeing, and is a perfect location to have lunch or reload on groceries. Several area golf courses offer beautiful views and a pleasant round of golf. Humpback Bridge is a 100-foot covered bridge over the picturesque Dunlap Creek—the only bridge of its kind in the state. A state park, it offers picnic tables and is the perfect spot for an al fresco lunch. Clifton Forge’s Ridgeway Street is filled with charming shops, art galleries, and dining. A downtown Must-See, the newly constructed C&O Heritage Center allows visitors to tour restored rail cars and learn the history of the C&O railroad. The Alleghany Arts and Crafts Center offers handmade goods from local artisans, and the Clifton Forge School of the Arts offers instruction in any number of activities and presents concerts and performances year-round. Rated the “Coolest Small Town in America”, Lewisburg is a charming town in the heart of the Greenbrier Valley. Wander through downtown art galleries and shops, have lunch in one of their many cafes or restaurants, then lose yourself in the Lost World Caverns or take in a live performance at Lewisburg’s Carnegie Hall. The Greenbrier resort is nearby, offering golf, shopping, dining, and spa amenities. For a unique experience, tour the presidential bunker. Located in Bath County, Virginia, Hot Springs (and nearby Warm Springs) offers several options for shopping, dining, and sightseeing. Enjoy a round of golf at The Homestead, then grab lunch or stroll through the shops downtown. The Shopping Village at the Homestead offers additional shopping/dining options, and a wide range of boutique stores. Also in Hot Springs, the Garth Newel Music Center is perfect for an evening concert.